As a Guest staying in a Disney Resort*, you’re entitled to remarkable benefits like Extra Magic Hours, Disney’s Magical Express, Disney’s Complimentary Transportation, Disney Dining Plan – and more magic all around. Benefits of MyMagic+ – Since you are staying at a Disney Resort, you will receive all the benefits of MyMagic+ including complimentary MagicBands and early access to FastPass+ reservations 60 days prior to arrival! Extra Magic Hours – As a Disney Resort Guest, you will have opportunities to add precious Theme Park and Water Park time to your vacation. Each day one of the Theme Parks opens an hour early or stays open up to two hours extra after regular Park hours so you can enjoy select attractions. Online Check-In Service – Simplify your arrival to the Walt Disney World® Resort by going online and provide information related to your upcoming stay. Disney Dining Plan – It’s an easy and affordable way to choose snack and meals at selected restaurants throughout Walt Disney World® Resort, including Disney Character dining. Best of all, you can relax knowing many of your meals are paid for in advance. Close To The Magic – Staying at a Disney Resort means being surrounded by magic 24 hours a day and also being close enough to return to your hotel for a snack, nap or dip in the pool. Complimentary Transportation – Disney Resort Guests are free to enjoy complimentary Disney transportation throughout the Walt Disney World® Resort. Just steps from the door, boats, buses and monorails await to transport you to and from the Theme Parks, Water Parks, the Disney Springs™ area and more. Complimentary Transportation to Resort Golf Courses – Guests staying at a Walt Disney World® Resort hotel will enjoy complimentary to and from any of the 4 Disney Championship Golf Courses. Uniquely Themed Pools – Our pools offer a relaxing break from the action in some of the most spectacular settings anywhere. From sand bottoms to serpentine water slides, each one is exciting and unique. Incredible Disney Service – Disney Cast Members are there to make your vacation as easy and worry-free as possible by offering helpful tips and recommendations. Package Delivery – Don’t worry about carrying packages around all day. Instead, enjoy the convenience of having purchases from select Disney shops delivered right to your Disney Resort. Charging Privileges – Disney Resort Guests can take advantage of charging privileges available with your MagicBand. You can charge select Disney purchases (i.e. meals, merchandise and tickets) to your room! 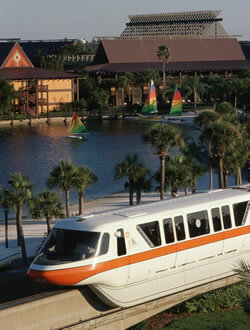 *Benefits listed apply only for Guests staying in Walt Disney World® Resorts which are owned and operated by Disney. Guests staying at the Walt Disney World Swan and Dolphin should refer to the benefit list which is specific to these two resorts . **Luggage delivery may take up to 3 hours after the Guest has checked in. Therefore, it is highly recommended that you pack a carry-on bag with any items that may be desired for use while awaiting delivery of luggage.